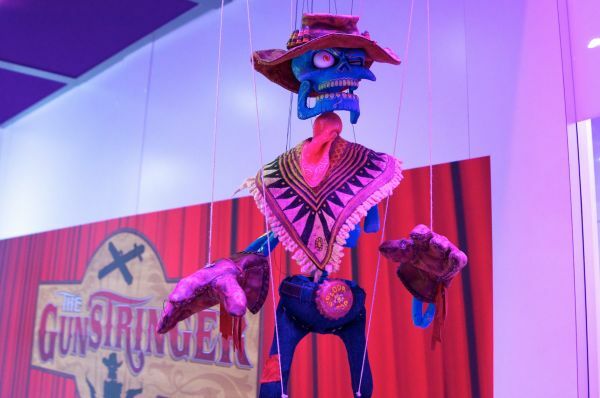 I went hands on with The Gunstringer at E3 2011, or rather, hands off since you aren't actually touching anything while playing the Kinect enabled game. The Twisted Pixel developed game oozed their style right from the get go as you take control of the Gunstringer in a four act play, complete with audience, applause and a narrator that reminds you of every western voice over ever heard. 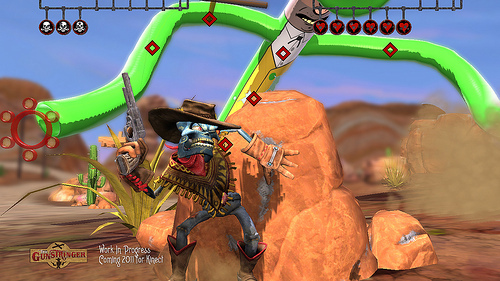 While The Gunstringer was originally slated to be a downloadable title, Twisted Pixel's Dan Teasdale told me the game is now a full retail title. Obviously the first question that comes to mind is - will there be enough substance to support that. I was assured there's plenty of content to make this game worth your $50. As I jumped into the prologue it became immediately apparent what Twisted Pixel was going for, that is, the art of puppeteering. I held my left hand out as if to hold the cross and strings of a puppet and could maneuver the Gunstringer left and right as well as jump over objects. Your right hand is used to highlight targets on the screen and then a quick flick of the wrist back unleashes bullets at your enemies. It's simple enough and it's strangely satisfying, like a kid playing cops and robbers with their friends. You progress through the levels in a mostly on-rails type fashion though you are given some freedom of movement, though you don't control the speed of movement. After dispatching some random outlaws it was onto a boss battle - a giant wavy inflatable tube man. He's part of a gang that the Gunstringer is hunting down in a tale of glorious revenge. Once again the mechanics remained the same as I highlighted targets with my right hand and shot rapidly as the Gunstringer moved from cover to cover. I was tasked with leaning in and out of cover throughout the battle to avoid being hit. Soon the wavy tube man deflated and the prologue was complete. The snippet I played was definitely fun, though I'm not sure how long I could stand there and hold my arms like I did - the total play session only lasted 10 minutes. I asked about the rumored co-op and Teasdale confirmed the game would support a second player, they only needed to stand up and wave to join in on the action. While they won't control their own Gunstringer, they will take control of a second pistol and can aim and shoot to help Player 1. I'm still not 100% sold on The Gunstringer, but Twisted Pixel has never failed me with their style and charm. I may pick it up based on that alone when it ships this fall. Page created in 0.2232 seconds.